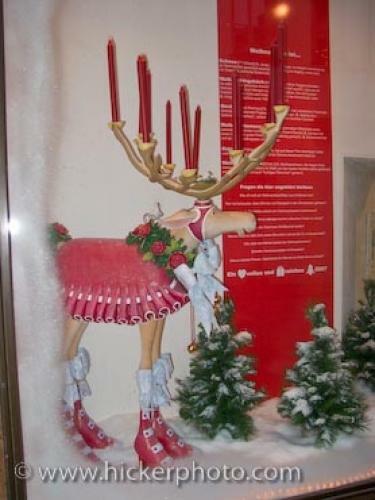 A statue of a moose adorned in Christmas decorations in a shop window in the old town of Regensburg in Bavaria, Germany. window in Regensburg in Bavaria, Germany. ... The town of Regensburg in Bavaria, Germany is a beautiful place to spend Christmas vacations where the whole town gets together to make the festivities of the Christmas season unforgettable.Funny picture of a moose decoration in a shop window in the old town of Regensburg, a UNESCO World Heritage Site, Bavaria, Germany, Europe. I photographed this photo with the digital SLR camera model Canon PowerShot G9, aperture of f/2.8, exposure time of 1/60 sec. on ISO 80, as always I used a original Canon Lens, the focus lenght for this picture was 7.4mm.